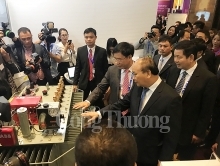 (VEN) - Vietnam is struggling to improve its space technology development. According to the Vietnam National Satellite Center (VNSC), Vietnam is lagging behind developed countries by 30-40 years in terms of satellite manufacturing technologies, and put into operation four satellites, fewer than Indonesia with 13 satellites, Singapore with 9 satellites, Thailand with 8 satellites and Malaysia with 7 satellites. Vietnam’s PicoDragon satellite was launched to the International Space Station (ISS) in early 2013 after about six years of preparation. During a three-month operation period, it successfully connected with domestic and international earth stations. This was a positive result proving that Vietnam could manufacture satellites despite only having basic technologies, said VNSC Director Pham Anh Tuan. On May 7, 2013, Vietnam launched the first optical earth-observing and remote sensing satellite, VNREDSat-1, at the Kourou satellite launch site. The satellite was programmed to photograph the surface of the earth and send them to the Vietnam Remote Sensing Center under the Ministry of Natural Resources and Environment. The VNREDSat-1 project received EUR55.8 million (more than VND1.5 trillion) in official development assistance (ODA) from the French government and VND64.82 billion in corresponding capital from the Vietnamese government. The satellite was designed to operate in five years. The VNSC has cooperated with foreign counterparts to research and develop Vietnam-made satellites and planned to design and manufacture the 10-kilo NanoDragon satellite by 2018 in order to implement forest and seagoing vessel monitoring and conduct technology experiments. The 50-kilo MicroDragon satellite was also scheduled to be launched by 2018 to pursuing climate change mitigation objectives and enhancing natural resource management and monitoring cloud coverage for atmospheric corrections. 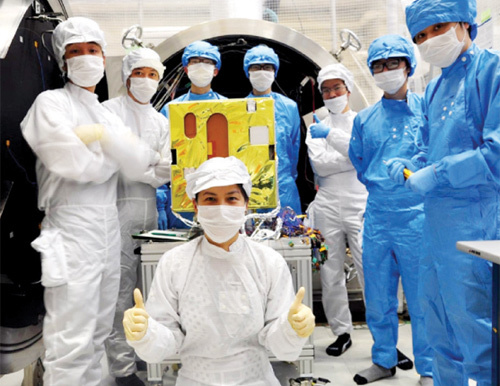 Japan and Vietnam cooperated to manufacture the LOTUSat-1 satellite and scheduled to launch it into the orbit in March 2019. Vietnam planned to manufacture and launch the LOTUSat-2 satellite in early 2022. These satellites will contribute to pursuing climate change mitigation objectives and would save the domestic agricultural sector about US$150 million. Satellite manufacturing requires huge investment and high technologies. Satellite expenses vary from several thousands to several hundred million dollars. Vietnam is struggling to promote international space technology cooperation especially with Russia, France, Japan and the US, according to Pham Anh Tuan. “Recognizing that one of the biggest difficulties in space technology development is how to have a skilled workforce, the VNSC positively engaged with vocational training at home and abroad. To date, it has 36 masters in space technology who were funded by the state budget to go studying in Japan and are engaged in the MicroDragon satellite project. 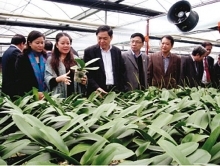 The University of Science and Technology of Hanoi and VNSC jointly implemented space technology masters and doctor training programs. Moreover, the University of Engineering and Technology and VNSC coordinated a space technology engineer training program. The Vietnam Space Center project kicked off on 9ha with total investment of more than US$600 funded by Japan and Vietnam is about to finish in 2017. This will be one of the most modern space centers in the Southeast Asia and also Vietnam’s largest invested science and technology development project over the past 35 years. According to the prime minister-approved Space Technology Research and Application until 2020 Project, Vietnam aims to be independently able to manufacture small satellites by 2020.